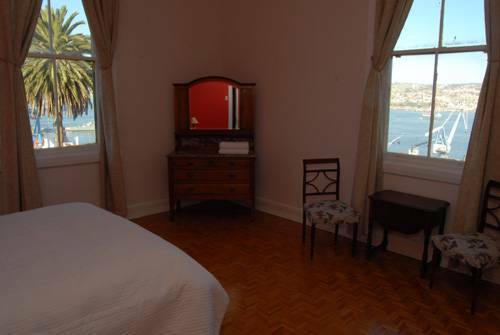 Our bed and breakfast overlooks the harbour and entire bay of Valparaiso offering a prime panoramic view from most of our the rooms as well as from our main guest terasse. 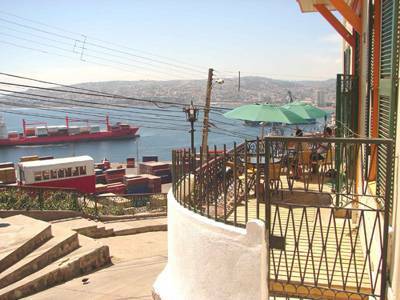 It is situated up hill, next to funicular station of Artillería, Museo Naval and 21 de Mayo Promenade. Our aim is to host traveller who expects a clean, neat and bright accommodation in an characterful old house with famliy atmosphare combined with excellent service. Breakfast included, also access to internet and WI-FI, hot shower 24 hours. 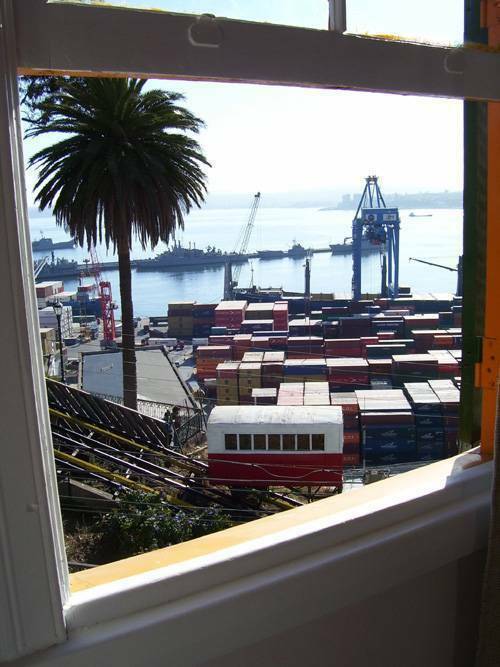 1 bedroom with 1 single bed, Great VIEW to Valparaíso bay, PRIVATE bathroom OUTSIDE room, wi fi access, breakfast included, white bed linen. Second floor (FLORES room). 1 Double bedroom (CELESTE room) with balcony, sea view, breakfast, wi fi, PRIVATE bathroom OUTSIDE room, 5 mts. Second floor. 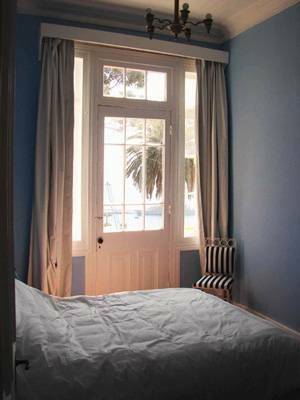 1 bedroom with 2 single box sping, white bed linen, PRIVATE bathroom OUTSIDE room, breakfast included, nice view to Paseo 21 Mayo, wi fi access (CATRES room). Second floor. 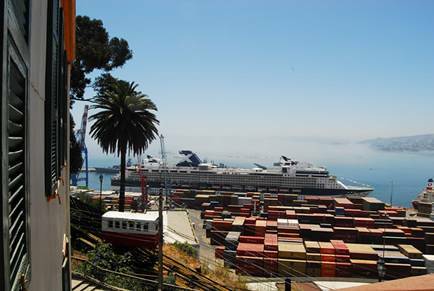 Chile residents have to pay the first night at least two days before they arrive. 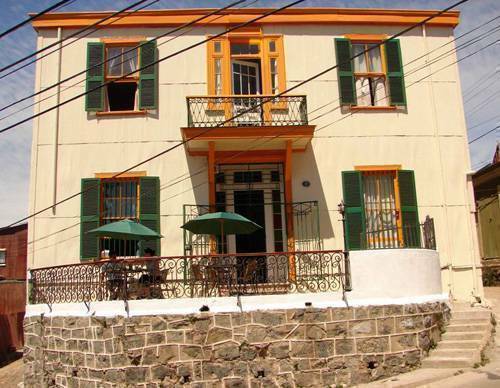 The house is situated on Artillería hill, up hill in front of Artillería elevator, next to the Navy Museum and 21 de mayo Promenade. You can take a bus at Bus Station (Pedro Montt avenue), they will leave you at Aduana building, there you can take de Artillería elevator that is in front of our guest house. Another possibility is to take a "colectivo" at Pedro Montt avenue (a type of share taxi), number 3 red sign that says "Pacífico", and tell the driver you are going to Paseo 21 The Mayo. It cost less than a dollar. Finally can take a taxi at the Bus Station.